Guys! is der ne eligible candidate to become MLA? from past 50 years nothing can hapnd here,,, but in last 5 years smthing got changed in BGM,, Yes tht is not gr8 change but smthing is better dan nothing. we need more n more changes, development.. initially at least a 2000 acre industrial(employment) park in city. better air connectivity, better administrative support from govt, better support from citizen and politicians. then only it will start to grow and we will get more n more in our Belgaum District. we must make our Belgaum as a next Destination, Next superpower of India. but who gona do this??? who gona bell the cat? all our candidates are Cats n we all are rats. we have talent, skill n strength but we are wasting it in other cities to make them best. we dont have ne option too. Belgaum is backward because of negligence by our citizen, politician, border issue and K’taka govt. coz all educated ppl got settled out of belgaum. uneducated ppl dont have employment, dey are frustrated nd became religious, egoistic n sick. remaining are are blaming each othr for kannada-marathi. they are selfish. they dont bother abt the development. they bother abt der political career and loot. -coz of this we dont have unity, so we are not able to fight for growth and development, unable to fight to get opportunities. we are unable to prove that belgaum is best. -Govt dont knw how much belgaum is potential. -they are not getting any extra political support from Belgaum. coz we all are busy with MES and KRV. -they dont want to invest coz of belgaum of belgaum border issue. -so govt is not very concern abt the overall development . i tried to convence my mother to not vote uneducated and selfish candidate. plz give your vote to someone best. she said i am marathi and will vote to marathi person. there were two candidates, one was from illiterate and selfish marathi candidate and other is bit reputed and hopeful Kannada candidate. she again said in marathi ” Tujhe Vichar bare nahit, tu hindu ahes ani tula tuzha dharma palava lagel. tuhe vichar badal, thoda dharmik Ban”. My dear frnds, for me being well educated guy its difficult to convince my own family. then hw to convince all citizen? even i dint mean to not vote marathi candidate. I did ask to vote a person who may try to make some changes. I pray to god , Plz give some extra abilities to bring some extra changes. i would support the candidate who dont want to make issues of language in Belgaum..
i will support the candidate who will support and help all the reglious communities of Belgaum ..
i will vote only for the candidate who wants Belgaum to be as big as India is.. I will support the Party who wants to excel without corruption ..
Thats right brother… we being so educated, we are not getting jobs in our native place. for jobs u need atleast minimum bachelor degree but for election no need any education. why we are lagging behind because the people are only doing showoff of the development. it is just on paper and it wil come out at the time of election only. in all these no one has the patroitic and future oriented. In their rally veryone just blamming on each other. really all people need to know that their future is dark if they choose wrong candidate. Many people will take money to vote candidate but they dont know now this one time they will receive the money but for next 5 years he have to pay for it. I love my belgaum and i am an engineer but we dont have good opportunities and good salary in belgaum. IT park desur was just an foolish idea of goverment to sell farmers land. 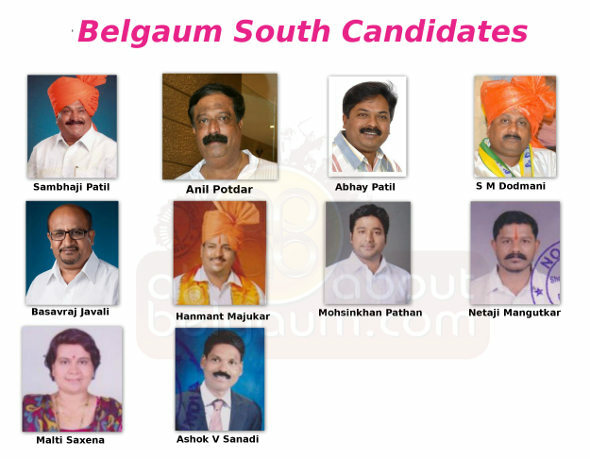 Please of belgaum choose right candidate for this time atleast.